National League strugglers Guiseley and Chester shared a point in a six-goal thriller at Nethermoor. Ryan Lloyd teed up Ross Hannah to give Chester what looked to be the game's only goal before a hectic ending. Emile Sinclair headed Oliver Norburn's corner to level before Will Hatfield gave Guiseley an 81st-minute lead. Kane Richards levelled just two minutes later while Sinclair looked to have won it after tapping in James Hurst's cross before Tom Shaw equalised again. Match ends, Guiseley 3, Chester FC 3. Second Half ends, Guiseley 3, Chester FC 3. Goal! Guiseley 3, Chester FC 3. Tom Shaw (Chester FC) right footed shot from the centre of the box to the centre of the goal. Assisted by John Rooney. Substitution, Guiseley. Danny Hall replaces Anthony Dudley. Goal! Guiseley 3, Chester FC 2. Emile Sinclair (Guiseley) left footed shot from the centre of the box to the bottom left corner. Assisted by James Hurst with a cross. Attempt saved. Ross Hannah (Chester FC) right footed shot from outside the box is saved. Offside, Guiseley. Emile Sinclair tries a through ball, but Emile Sinclair is caught offside. 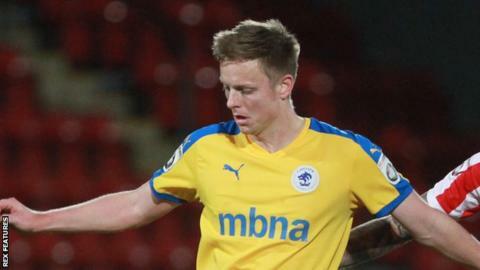 Foul by Tom Shaw (Chester FC). Ben Parker (Guiseley) wins a free kick. Foul by Sam Hughes (Chester FC). Anthony Dudley (Guiseley) wins a free kick. Goal! Guiseley 2, Chester FC 2. Kane Richards (Chester FC) right footed shot from the centre of the box to the bottom left corner. Assisted by Ryan Higgins. Substitution, Chester FC. Kane Richards replaces James Alabi. Goal! Guiseley 2, Chester FC 1. Will Hatfield (Guiseley) right footed shot from the right side of the six yard box to the bottom left corner. Assisted by Oliver Norburn. Attempt saved. Oli Johnson (Guiseley) right footed shot from outside the box is saved. Attempt missed. James Hurst (Guiseley) right footed shot from the centre of the box misses to the right. Assisted by Oliver Norburn. Goal! Guiseley 1, Chester FC 1. Emile Sinclair (Guiseley) header from the right side of the six yard box to the top right corner. Assisted by Oliver Norburn with a cross. Substitution, Guiseley. Oli Johnson replaces Gavin Rothery. Attempt saved. Gavin Rothery (Guiseley) right footed shot from outside the box is saved. Attempt missed. Ryan Toulson (Guiseley) header from the right side of the six yard box is too high. Assisted by Gavin Rothery. Attempt saved. Oliver Norburn (Guiseley) right footed shot from outside the box is saved. Foul by John Rooney (Chester FC). James Hurst (Guiseley) wins a free kick. Foul by Robert Atkinson (Guiseley). Ben Heneghan (Chester FC) wins a free kick. Substitution, Guiseley. Oliver Norburn replaces Jake Lawlor. Foul by Adam Lockwood (Guiseley).